What's the Best Electric Car Cooler (Personal Size)? What’s the Best Electric Car Cooler (Personal Size)? 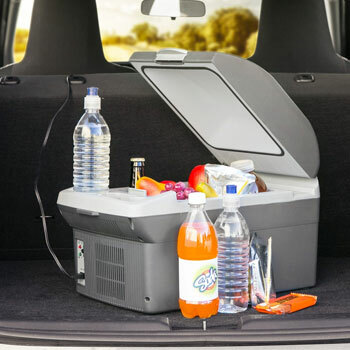 Are you looking for a personal-sized car cooler that you can use on a daily basis? Something that can keep meals warm or keep drinks chilled throughout the day? I’ve found that the best option is the Black & Decker Travel Cooler/Warmer. It cools and heats quickly because of its smaller size. It also conveniently costs less. Another cool feature of the TC212B is that when it senses low voltage, it will automatically shut off. This way, it will not drain your car battery and leave you can your vehicle stranded. 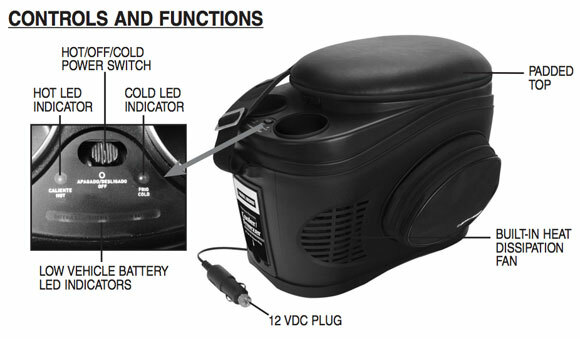 Just like other travel coolers, you simply plug it in to your vehicle’s 12 V DC outlet. Since it is smaller in size, it’s more versatile in regards to where you can put it. Some people keep it on the floor of the car, the seat or even in the hatchback if a power source is available. What’s great about personal car coolers is that they often have cup holders. This can be especially nice if you are using your cooler to store beverages. You can never have too many drink holders, right? This travel cooler also comes with a convenient zippered side storage compartment. How many times have you reached into a cooler… and forgot to pack a bottle opener, a corkscrew or even napkins? This is the perfect spot for those. Black & Decker is well-known for making durable, reliable power tools, gardening equipment, kitchen appliances, batteries, chargers and more. In fact, they have an entire site dedicated to 12-volt products, including jump starters, power inverters, lights and portable travel coolers. You can find more detailed information on features, operating instructions, care and maintenance and the warranty on the product manual here. Want a Bigger “Personal-Size” Cooler? If you want a personal-sized cooler that is a little larger, Wagan makes a cooler/warmer that has a 14L capacity (instead of 9L). It has a similar design, features and customer rating to the Black and Decker model above. The main differences are its size and cost (about $20 more). Both products get power through the vehicle’s 12V DC outlet, include a carrying strap and provide both cooling and heating options. Neither need ice to chill.